One cold night the wind was whistling and the waves burst onto a ship from Chios. All hope for salvation was lost! The ship rocked up and down, constantly taking in water. At the Monastery of Saint Mark on the island of Chios a service was being conducted. 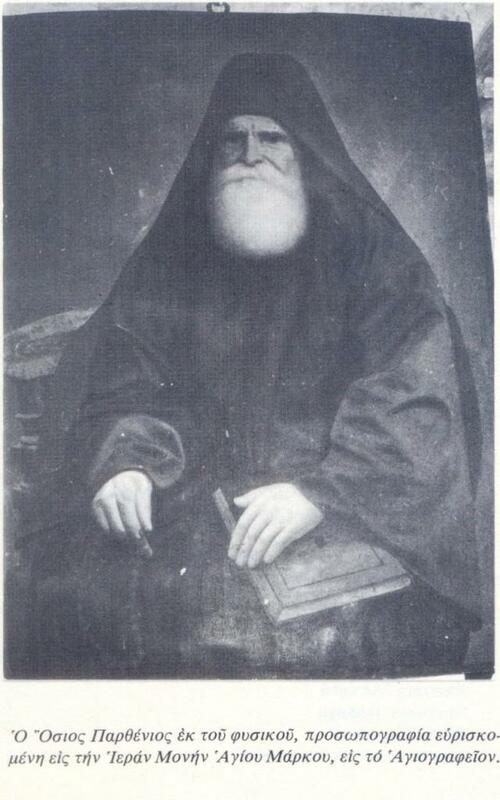 The sailors who were in danger were good friends of this monastery and its abbot, Saint Parthenios of Chios (1815-1883). The captain, Zanaras from Vrontado, prayed from his heart: "My God, save us through the prayers of Elder Parthenios, and whatever cargo the ship has we will take to the monastery." Meanwhile the Saint was back at the monastery praying, when he suddenly became motionless. His eyes remained fixed on the icon of Christ, as he raised his hands in prayer and found himself in a state of ecstasy. His fellow monks see what is going on, and they jot down the time and day when this was taking place. Back at the ship, Captain Zanaras had not yet finished his prayer, when he looked and saw a monk steering the wheel of the ship. He glanced at him with an encouraging smile. "It's Parthenios!" they all yelled, "the Elder from Saint Mark's." The ship began to rock less and less. The wind began to cease blowing. There was great calm. Saint Parthenios then disappeared. After a few days had passed all the sailors and the captain of the ship went to the Monastery of Saint Mark. As was promised, they unloaded the cargo of the ship and brought it up to the monastery on mules. Before they went home they first wanted to thank God and the Saint for their salvation. With reverence and fear of God the rescued crew narrated all that happened to them to the monks and the great miracle they witnessed. The monks checked the records where they jotted down the time and day their Elder fell into ecstasy and prayed motionless. It was the same time and day as when the miracle took place.